Most people are eager for spring because of the sun, in my case the main reason are blossoming trees! 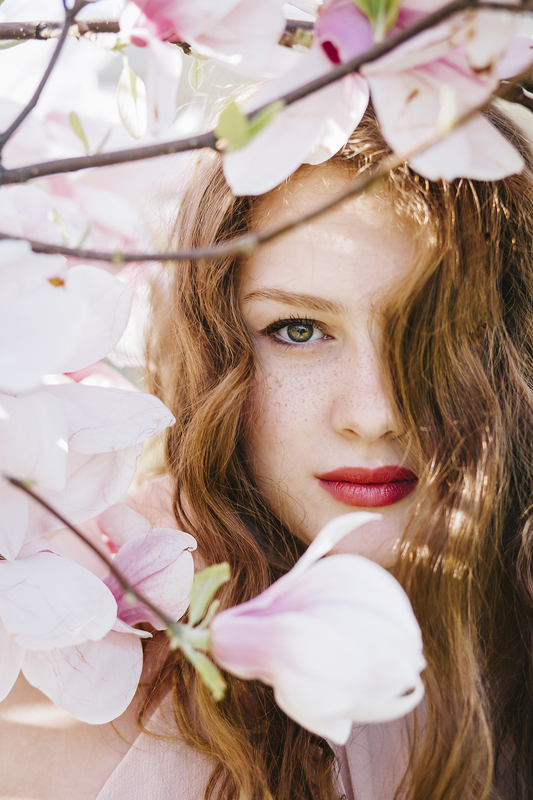 I am literally obsessed with magnolia trees, cherry blossom, fruit trees, lilac, the list is endless. From mid March I start checking for the first signs of blossoms around the city, wait for them to open and then off I go to take thousands of pictures. And daydream of living in a house surrounded by those precious shades of pink! 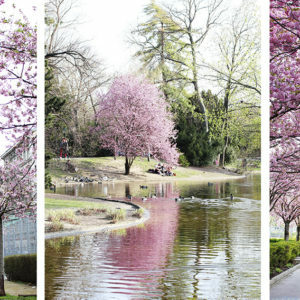 I already shared a post about cherry blossom trees in Vienna, that you got to check if you are a blossom fan. But magnolia trees are my absolute favorite, so they deserve a post too! Bookmark this post and get ready to shoot soon. 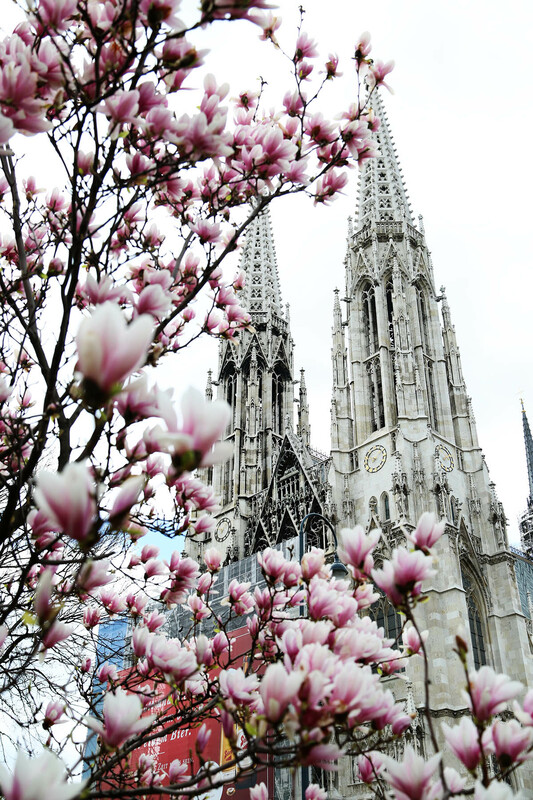 When are Magnolias in Vienna blooming? Now let me officially respond on the most requested question I get via email and Instagram at this time of the year. Magnolias start blooming from the 3rd week of March and the blossoms last unfortunately really short. Around 2 weeks or a bit longer and that’s it until next year. If you want to capture them in full bloom, ideally would be next week, so the last week of March. I will start the list by sharing the beauty everyone knows about – rustic, pale pink magnolia tree in front of Votive church. As soon as it blooms, Instagram gets flooded with captures showing Votive church framed by this magnolia. This tree is iconic, I have seen it grow over the years and took pictures of so, so many people in front of this tree that I already lost count. 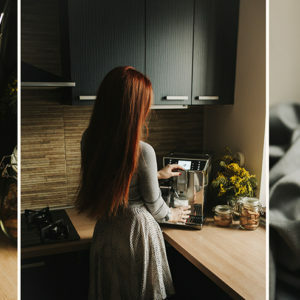 However photo-session with a wonderful ginger girl Nejla will remain my favorite. You can see more of it in a separate post, and down below a few shots. By the way, Nejla is modeling in her free time, so if you are a photographer or a brand and want to work with her, you can contact her via Facebook here. 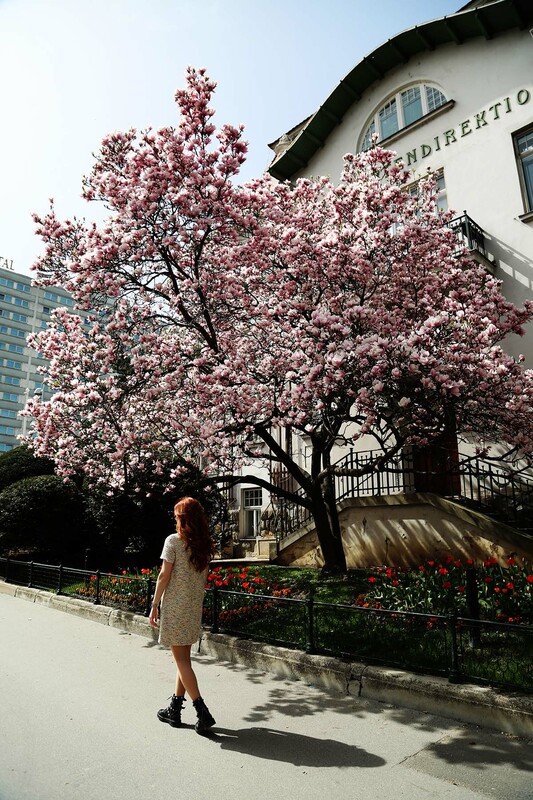 One of the largest magnolias in the city, this beauty close to Stadtpark will take your breath away! The first time I photographed it was with my lovely friend Octalita (calligraphy teacher, if you want to learn this beautiful art, make sure to visit one of Octa’s workshops. She is the most patient and kindest person ever!) and ever since I return to this tree every single year. She is a bit off sight, because it is located in front of the building of Stadtgartenamt (Municipal Department for Parks and Gardens). So the exact address of this magnolia is Johannesgasse 35, 1030 Vienna, but you need to get behind the corner, to the street Am Heumarkt. Your jaw will drop when you see it! If you are going by metro, you need U4, stop Stadtpark, exit to Johannesgasse and then turn left. You will be there in a few seconds. 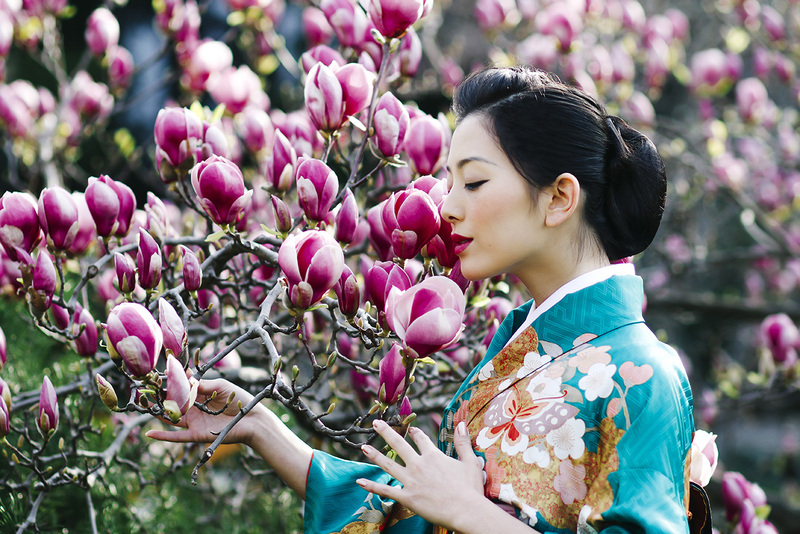 The blossoms should already be open after 20th of March, so now is the time to run there. The gorgeous silk scarf you see here is from Issa Art Studio. It is handpainted by our lovely friends Isidora and Ljubica. A must-have for spring! Take a look at their wearable art here. White magnolias don’t have such a big flower as the pink ones, but without a doubt they are gorgeous too! 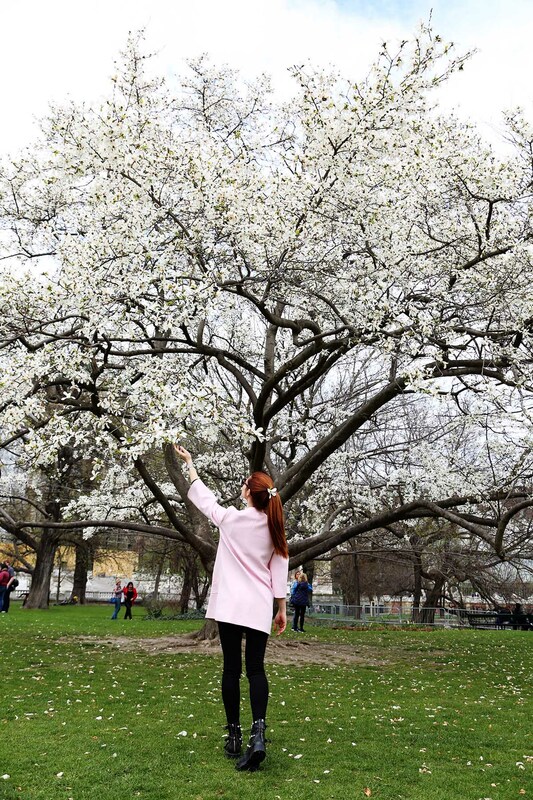 You will find the largest white magnolia in Vienna right in Burggarten! People usually chill under the tree, the whole scene looks like from some old paintings. Join them for a while after you finish shooting and savor the moment. 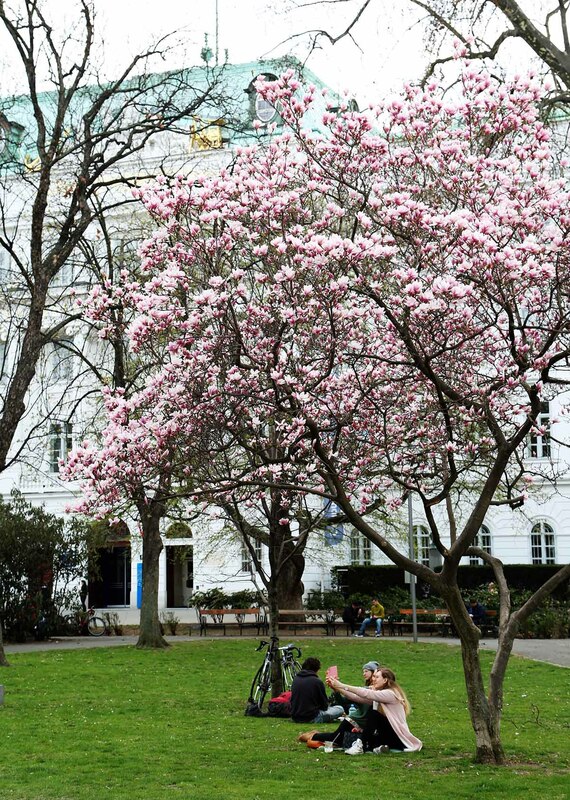 The trees planted along Kärtnerstrasse are actually white magnolias! They don’t have many blossoms, but still deserve to be mentioned here. I guess in a decade or so, they will spread enough to create a nice shade and gorgeous view of Kaertnerstrasse. In case you missed most magnolias, worry not, this one will for sure be blooming until the end of first week of April. I have bad luck with shooting it, was there last week and it was not even close to bloom. But in the streets surrounding the park, you will notice many nice ones that already bloomed. 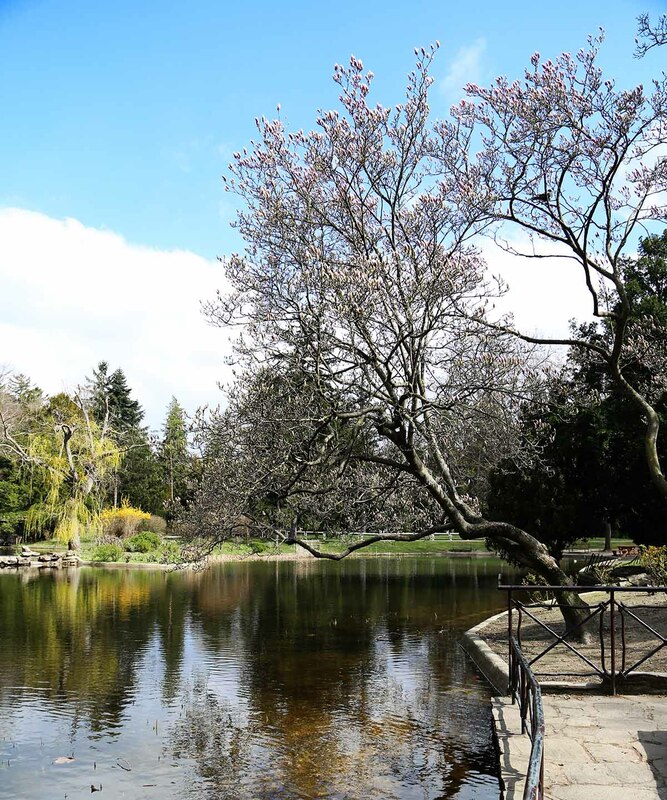 Setagaya park was mentioned over and over again on our Vienna Insider blog! You can see our first post over here, and the second legendary post when I photographed my one and only Japanese friend Manaho, artist and dancer, here. If you haven’t yet, make sure to read that post! Besides gorgeous pictures, it contains insider tips of Japanese in Vienna and whole lot of inspiration. Back to magnolia, over here you will find a white-pink gorgeous tree, framing the view of Setagaya garden, but also pink magnolia planted right next to the bridge. Along with many other blossoming trees all over the place! In spring it is really a sin not to visit Setagaya garden! 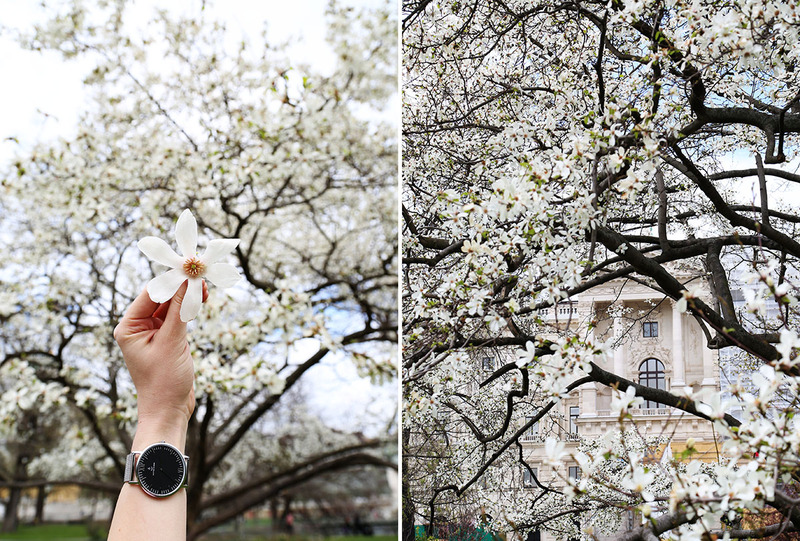 A small but pretty magnolia can also be found nearby Karlskirche, so right at Karlsplatz. Ideal location for a chill in the pink shade. The districts I mentioned above, are mainly residential. There are many gorgeous houses along it and most of them have a gorgeous magnolia in front of them. 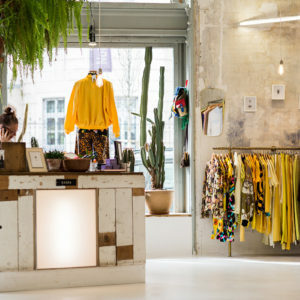 For example, when it comes to the 18th district, you can simply take a tram number 41, drive to the end stop (Pötzleinsdorf) and along the way enjoy the views of gorgeous houses and their magnolias. 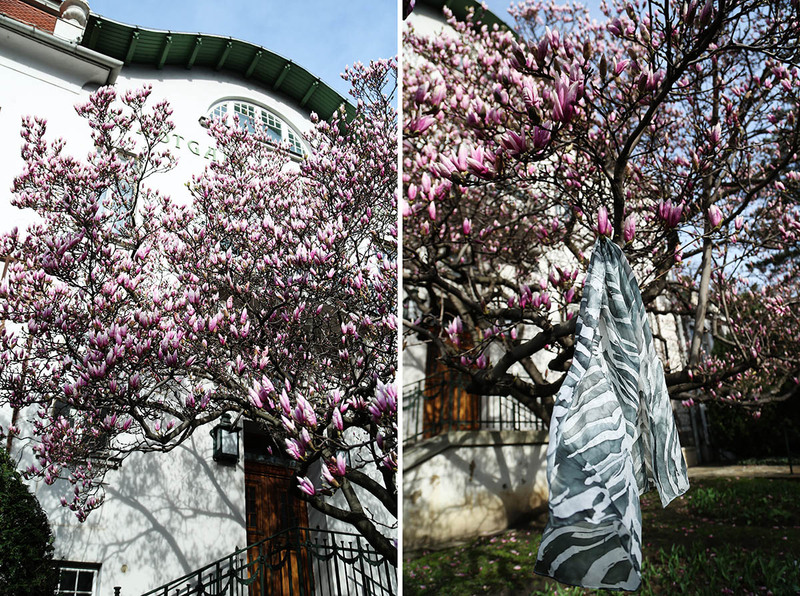 Also in front of Uni BOKU, in the 18th district, you can see a beautiful big magnolia. 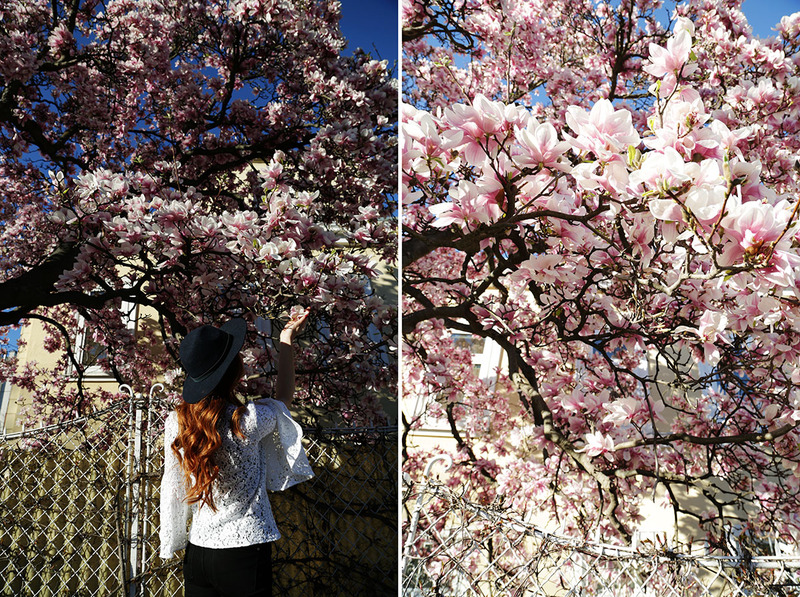 Hietzingerhauptstrasse in the 13th district turns pink at this time of the year, as magnolias bloom at every corner! And the same applies to Döbling. 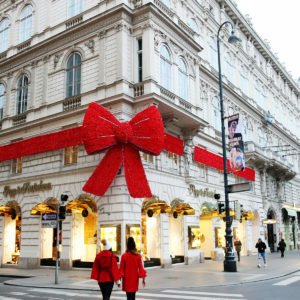 Up in the 10th district, is one of the Viennese largest gardens! Take a look at one of my favorite blog posts here about top picnic locations around town, that I shot in this park with my friends. 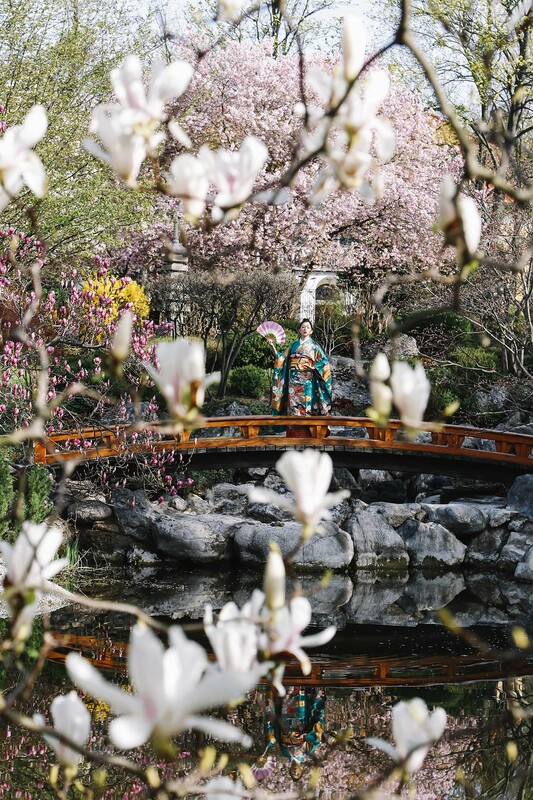 They have there many magnolias in different colors, that are “easily accessible”, so not too tall, so that you can be very close to the blossoms and create some wonderful pictures. That’s it for now! As I discover new locations, I will be updating the post as well as sharing on Instagram, so make sure to follow us there on @viennainsider. If this post helped you and you liked it, it would be nice of you to take a second to share it with your friends on Facebook and Instagram! And also if you visit some of the places I discovered you here, tag @viennainsider on Instagram! As you know, in our feed we only share photos taken by us, but we would love to see yours and share them on our Insta Stories. Until next post, enjoy the most pink time of the year and thank you for reading!